Annis Gardner G, r 16 1/2, farmer 70, wild land 19. Annis Richard, r 16 1/2,, farmer 75, wild land 60. Annis Sylvanus. r 16 1/2, farmer with G. G.
Annis William F., r 16 1/2, farmer with G. G.
Bailey Jesse P., (Groton Pond) asst. postmaster, clerk for Baldwin & Hazen. Bailey John B., r 12, farmer with Percival. Bailey Myron C., r 35, resident with Simeon Fifield. Bailey Percival, r 12, 350 sugar trees, farmer 100. Baldwin John, r 19, 400 sugar trees, farmer 50, and at W. Groton 50. Baldwm & Hazen, (Groton Pond) (E. BaldwIn, Jr., ot Wells River, and L. D. Hazen, of St. Johnsbury) props. of steam saw-mill, and 5,000 acres of timber land, manufs. and dealers in all kinds of lumber, and dealers in general merchandise. Bancroft Henry R., lives over R. R. station, ticket and freight agent for W. R. R. R., telegraph operator. Blanchard Lyman, r 28, sawyer, h and 4 acres. Brown Albert H., r 32, 300 sugar trees, farmer 125. Brown David, r 32, farmer. Brown Olive, r 32, widow of John. Burnham George H., clerk for Hall & Cochran. Burton James, r 28, farmer. Caldwell John, r 11 cor. 9, 300 sugar trees, farmer 70. CARPENTER ANDREW J,, retired manuf., h and lot. Carpenter George W., r 33, foreman for Thomas B. Hall, h and lot. Carpenter Hannah, widow of Eliphalet, lives with Andrew. Carter Allen H., r 39, 400 sugar trees, farmer 60. Carter Jozette, r 34, widow of Luther, lives with Horace. Chamberlain Sophronia, r 28, widow of Franklin, h and lot. Clark Albert S , r 28 n 15, coal burner, contractor for T. B. Hall. Clark Arvills, r 21, widow of Benjamin F., resident. Clark Austin, tanner, lives with his mother. Clark Benjamin F., justice of the peace, harnessmaker, boot and shoemaker, opp. Railroad Hotel, Main. CLARK HORACE C., wheelwright and carriagemaker. Clark Lois, widow of William, farm 34. Clark Manly, postmaster, fancy goods, dealer in firearms, h and lot. CLARK WALLACE N., carpenter and builder, h Main. Clough Alexander B., laborer, Main. Clough George W., pastor Baptist church, first h west of Bastrst church. COFFRIN ALBERT W., jeweler and dealer in hats, caps, gents' furnishing goods, groceries, crockery and glassware, watches, clocks, plated ware, cutlery, etc., Coffrin's block. Coffrin Daniel, Jr., farmer 75, wood land 100. Coffrin Morris D., r 17 n 33, farmer, leases of Daniel W. 50. Corruth George, r 29, h and lot, farm 21. Corruth James R , r 30, farmer 16. Crown Calvin C., r 30, 400 sugar trees. farmer 90, wood land 50. Crown Frank, r 30, farmer with C. C.
Crown Orrin M., r 31, farm laborer. Daily Albert L., r 36, farmer, leases of J. R. Darling 85. Daniels Nathaniel, r 33, laborer. DARLING DANIEL R., r 34, manuf. of lumber, h and lot. Darling Elmer E., resident with Jonathan R.
Darling Isaac N. H., r 34, 260 sugar trees, farmer 70, wood land 150, other land 125. Darling John H., off r 34, farmer 30. Darling John T., resident with Jonathan L.
DARLING JONATHAN R., town clerk twenty six years, justice of the peace. lumber-mill in Peacham, 700 sugar trees, 2,000 acres, 1,500 other land, farmer 100. Darling Robert N., resident with Jonathan R.
Darling Samuel, 600 sugar trees, farm 100. Darling W. Brock, student at Montpelier. Davis Henry E., r 21, sawyer. Dean Silas, superanuated Baptist preacher. Donahue Jeremiah, r 21, farm laborer. Dow William, retired blacksmith, farmer 50. Downs Franklin P., painter and paper hanger. DUNN JOHN K., r 1, 600 sugar trees, 2 Jersey and 10 grade cows, farmer 285. EASTMAN SETH N., M. D., allo. physician and surgeon, 2d house west of Methodist church, h do. Emery Elbridge, r 34 1/2, farmer 25. Emery Jeremiah, r 17, 700 sugar trees, farmer 100. Emery Simon. r 17, 300 sugar trees, farmer 50, soldier in Co. C, 3d Vt. Regt. Emery Timothy, r 34 1/2, 1,000 sugar trees, farmer 70. Emery Timothy, Jr., r 34 1/2, h and lot, 200 acres wild land, soldier in 3d Vt. Regt. Evans Charles, r 35, laborer. Farnsworth Charles H. Rev., pastor M. E. church, lives in parsonage. Fifield Simeon D., r 35, 1,000 sugar trees, farmer 100. Foster Ansel, r 33, with Charles. Foster Charles, r 33, farmer 25. FRIZZELL CHARLES H., harness maker, h and lot, soldier in 5th N. H. Regt. Frost Aaron, off r 39, 2,000 sugar trees, farmer 80. Frost Bradley M., r 39, cooper, farmer 40, soldier in Co. G, 104th Ill. Regt. Frost Elijah, r 32, farmer. Frost Isaiah, off r 34, farmer 50. 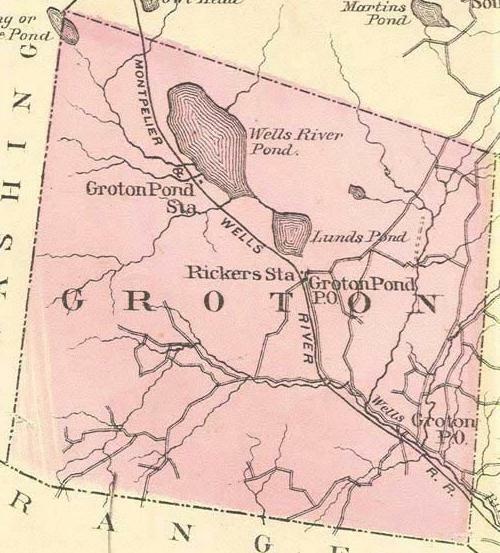 Gay William, (Groton Pond) emp. of Baldwin & Hazen. GILMAN HEMAN L., prop. grist-mill, custom grinding, dealer in flour, grain, fine feeds, also Quinnipiac fertilizer. Glover Fred W., r 25, carpenter, h and lot. GLOVER HENRY C., r 11, deputy sheriff, constable, justice of the peace, farmer, with his father, 80. Glover Otis, r 11, 400 sugar trees, farmer, with Henry C., 80. Goodwin Abner, r 36, 500 sugar trees, farmer 110, wood land 60. Goodwin George W., off r 53 n 15, farmer 85. Goodwin Thomas, r 33, shingle maker, farmer 50. GOODWIN WILLIAM E., r 28 cor 15, carpenter, contractor and builder, millwright, owns farm 30. Greenleaf John, r 33, laborer. HALL ISAAC N. Hon., (I. N. Hall & Son) agent Vt. Mutual Life Insurance Co., 500 sugar trees, farmer 100. HALL THOMAS B., (Hall & Cochran) and (I. N. Hall & Son) justice of the peace. prop. lumber-mill. HALL I. N. & SON, (Thomas B. Hall) props. of charcoal kilns, live stock dealers, own farm 80, and other land 1,000. Hall & Cochran, (Thomas B. Hall and Alexander Cochran, of Ryegate) general merchandise, agents for Bradley's phosphate. HARVEY JOHN C., r 28, manuf. of bobbins. Hatch Abbie, r 28, widow of Joseph. Hatch Clark, r 25 cor 23, farmer 5. HATCH GEORGE B, M. D., (Newbury) r 25 car 23, physician, prop. saw-mill at Lanesboro, Orange Co., and 900 arces wild land, farmer 5. Hatch John F., r 32, 1,000 sugar trees, lumberman and farmer 200. Hatch Oscar C., r 32, 500 sugar trees, farmer 100. Hayes William H., r 28, carpenter. Hayes William, r 28, carpenter. Heath Augustus M., r 28, justice of the peace, surveyor, dealer in wood, lumber and bark, farmer 7. Heath Benjamin F., off r 27. carpenter and farmer 20. Heath C. Frank, r 17 n 16, farmer. Heath Frank P., r 28, laborer. Heath Hazen C., r 36, farm laborer. HEATH JAMES M., r 18, 5 grade Jersey cows, 1,000 sugar trees, farmer 200. Heath Josiah P., r 28, laborer. HEATH ROBERT T., off r 36, 2,000 sugar trees, farmer 200. Heath Robert T. Jr., off r 36, farmer, with Robert T.
Hood Horace, r 34, farmer 10. Hood Levi, r 29, farmer 30. Hooper lsabell, r 16, widow of Jacob, 300 sugar trees, farmer 130. Hooper John, r 22, 1,000 sugar trees, farrner 200, wild land 160. Hooper Richard S., farm laborer. Hooper Samuel R., retired farmer, h and lot. HOOPER STEPHEN W., r 16, 100 acres wood land, with Richard S.
HUTTON HENRY, off r 15, 600 sugar trees. farmer 120. Keenan Edward F., r 31, resident, with C. C. Renfrew. Kidder James, r 40, farmer, with T. J.
Kidder Thomas J , r 40, farmer 100. King Samuel, log turner for A. H. Ricker. Kittridge Edwin, r 21, farm laborer. Kittridge Frank A, r 21, sawyer. Kittridge Lucina, r 21, widow of Zephaniah, h and lot. Knox George H.. r 29, stationary engineer. Laflame Louis, (Groton Pond) emp. of Baldwin & Hazen. Lovell Ebenezer A., r 29 near 31, farmer 50. Lund Rufus C., r 5, resident. McCrea Neil, r 8, sawyer, 2,600 sugar trees, farmer 100. McLaughlin William J., Jr., r 18, 1,000 sugar trees, farmer 200, wildland 25, leases of William. Melville George, r 27 cor. 29, farmer 15. Minard Fremont S., r 21, blacksmith, horse shoeing, etc., farmer 17. Minard Selden H., r 21, retired blacksmith, with his son, Fremont S.
Morison Abraham. r 41, 250 sugar trees, farmer 75. Morrison Benjamin F., r 31, 400 sugar trees, farmer 120. MORRISON J. W. & A. N., r 21, 250 sugar trees, farmer 70, cedar swamp 13 acres in Barnet, in Ryegate 9. Morrison Orrin, r 31, farmer 90. Morrison Sarah, r 21, widow of Timothy, 650 sugar trees, farmer 50. MORRISON SILAS B., blacksmith, served in Co. D, 15th Vt. Vols. Morrison Timothy, r 14, 400 sugar trees, farmer 100. Morrison William, r 28, stone mason, h and 5 acres. Olney George, harnessmaker, h and lot. ORR CHESTER, r 4, farmer 59, soldier 1st Vt. Cavalry. Orr James, r 4, retired, farmer 130. Orr John, r 7, 300 sugar trees, farmer, leases of William McLaughlin 137. Orr Robert H., r 5, 300 sugar trees, 9 cows, farmer 200, with William S. 80. Orr Ruth B., widow of William, h and lot. Orr William S., r 4, 8 grade Jersey cows, farmer, leases of James Orr 130, and with R. H. 80. Orr Washington, r 7, carpenter. PAGE ALBERT, off r 39, 500 sugar trees, farmer 100. Page Alexander, r 4, farmer 160. PAGE BENJAMIN, off r 39, 700 sugar trees, farmer 100, and in Topsham, Orange Co., 50. PAGE FRANK M., attorney at law, lister, tax collector, farmer 7, Main, h do. PAGE FRANK W., r 33, mechanic and farmer 10. PAGE GEORGE G., r 38, farmer 10, soldier in 3d Vt, Regt. Page Leverett H., off r 16 n 17, prop. Lake House, woodland 125, served in Co. C, 3d Vt. Vols. PAGE MOSES, Jr., r 38, shingle maker, 2,000 sugar trees, farmer 150, soldier in 3d Vt. Vols. Page Stephen, r 15, laborer. Parker Fred E., r 34, farmer 34. Parks Robert, r 28, emp. of A. S. Clark. Parnell & Antonio, boots and shoes, Main, Orford, N. H.
Pierce Charles N.. r 8, farm laborer, h and lot. Pillsbury George H., resident, Coffrin's Block. Pillsbury George H. Mrs. & Co., (Mary Chalmers) millinery, dressmaking, dealers in fancy goods, hats, bonnets, gloves, laces, etc., Coffrin's block. PLUMMER EBENEZER, r 29, farmer 42. PLUMMER MOSES, r 12, 7 grade Jersey cows, 500 sugar trees, farmer 100, district clerk for 36 years. PLUMMER ROBERT S., r 27, butcher, dealer in Cumberland phosphate, farmer 170. PLUMMER SAMUEL, r 8, 12 grade Jersey cows, 12 other cattle, 1,800 sugar trees, farmer 270, wild land 50 and in Topsham, Orange Co., 30. Pornber Sevar, (Groton Pond) emp. of Baldwin & Hazen. Provost John Baptist, off r 33. woodchopper, h and 2 acres. RAILROAD HOUSE, Aaron Welch, prop. Parties conveyed to other towns at reasonable rates. RAND GEORGE P., r 21, runs circular saw-mill for I. M. Ricker. RANDALL JONATHAN W., r 31, carpenter, 250 sugar trees, farmer 130, with Sidney G.
Randall Mary J., r 39, widow of Samuel, lives with Bradley Frost. Randall Sidney G., r 31, farmer with Jonathan W., 130. Remington Oliver H., r 21, farmer. Renfrew Archibald P., r 27, lister, retired merchant, farmer 5, and with Samuel P. Welch, 250. Renfrew Carlyle C., r 31, farmer 100, and in Topsham 30. RlCKER AMAZIAH H., r 17, lister, manuf. of lumber of all kinds, spruce and hemlock packing boxes, sheathing and dressed flooring, laths and clapboards, hemlock bark, wood, chair stock, etc., farmer 100, wild land 900. Ricker Benjamin M., r 27, town auditor, dealer in lumber and bark, 500 sugar trees, farmer 150, wild land 850. RICKER CHARLES A., lumber dealer, 200 acres wild land, h and lot. Ricker Edwin D., r 17, foreman for A. H.
RICKER GEORGE, r 8, 700 sugar trees, farmer 125, other land 180. Ricker Horace C., r 25, blacksmith and machinist with J. D.
RICKER ISAAC M., lumber manuf., clapboards and shingles, farmer 15, 1,000 acres of wild land. Ricker Joseph, Jr., r 14, 800 sugar trees, farmer 100, wild land 140. Ricker Josiah D., r 25, blacksmith, wheelwright and machinist, shop n bridge, h and 3 acres, served in Co. D, 15th Vt. Vols. Ricker Orson, r 28. 1,000 sugar trees, farmer 300, other land 300. Rindeau George, r 21, laborer. Rindeau Lyman, r 21, tanner. Roberts John, retired farmer, aged 83 years, oldest man in town, h and lot. Roberts Lucy, r 25, widow of Daniel, farm 27. Rugg Elbridge B., r 18, laborer. Scott George, harnessmaker for B F. Clark, h Main. SMITH FRANK P., r 21, shoemaker, h and lot. Sployd Cornelius, r 2, farm laborer, h and lot. Stowell Lavina S., widow of Leander. Tabor Hiram, r 35, farm 80. TAISEY GEORGE W., r 25, farmer with his father. William. Taisey Phebe, widow of John, aTed 89 years, oldest person in town. Taisey Thomas H., r 28, 1,200 sugar trees, farm 150. TAISEY WILLIAM, r 25, 1,000 sugar trees, 150 apple trees, 10 cows, farmer 200, and in Topsham 80. Thurston Ora, r 33, mechanic, h and lot. Thurston Peter, r 33, resident. Thurston Stephen, r 33, laborer. Vance David H., r 37 1/2 farmer 110. Vance George H., r 37, 1,000 sugar trees. farmer 300. Vance Joseph E., section hand M. & W. R. R. R.
Vance Morris C., r 37 1/2, 14 grade Jersey cows, 3,000 sugar trees, farmer 198, served in 3d Vt. Regt., Co. C.
WELCH AARON, prop, of Railroad House, Main. Welch Alexander G., foreman for Hugh Gibson in tannery, h Main. Welch Alvin, r 28, farmer 15. Welch Ara, r 19, farm with John M. 50. Welch Carlos, r 34, manuf. of lumber with Joseph T., 1,000 sugar trees, farmer 130, wild land with Peter 120. Welch Carlos B. & Joseph T., r 34, rnanufs. hard and soft wood lumber. Welch Cyrus H., farm laborer, h and lot. Welch Elbridge M., owns h and store. WELCH HOSEA, r 4, (A. Welch & Sons) 1,300 sugar trees, 8 cows, farmer 123. and with Warren and Loran 310. h and lot. Welch Hosea, 2d, r 21 cor 28, restaurant, 1,000 sugar trees, farm 30. WELCH H. & SONS, r 27, (Hosea, Warrer, M. and Loran G.) lumber mill and clapboards. Welch James A., r 7, 1,000 sugar trees, 11 grade Jersey and Devon cows, farm 196. Welch James M., r 41,farmer 50, wild land 100. Welch John H., r 20, breeder of Morgan horses, 1,500 sugar trees, farmer 210. WELCH JOHN M., r 19, 6 grade Jersey cows, 800 sugar trees, farmer 50, and with his father, Ara, 50. Welch Joseph T., r 34, manuf. of lumber with Carlos, farmer 100. Welch Lebbeus, r 13, 1,000 sugar trees, farmer 100. Welch Leverett H., r 33, sawyer, h and lot. WELCH Loran G., r 8, (H. Welch & Sons) carpenter, blacksmith, and sawyer. Welch Martha, widow of Jonathan, 2,000 sugar trees, farm 125. Welch William Merrill, r 41, 400 sugar trees, farmer 60. Welch Peter,r 34, 1,200 sugar trees, farmer 20. other lands 140, with Carlos 50. WELCH SAMUEL P., selectman, general merchant. flour, grain,feed, hardware, drygoods, lumber, woodland 150 acres, and with A. P. Renfrew 250. Welch Stephen, r 40 cor 41, farmer 80. Welch Timothy, r 40, 400 sugar trees, farmer 100. WELCH WARREN M., r 7, (H. Welch & Sons) saw-mill, clapboards, etc., owns 50 acres wild land with Loran G.
Welch William M. Jr., r 39, 800 sugar trees. farmer 60. WHITCHER NELSON, r 23, 400 sugar trees, farm 50, wild land 250. Whitehill Albert P., 300 sugar trees, farm 132. Whitehill Dolly, r 28, h and lot. Whitehill James, r 23, farmer with his son Newton 110. Whitehill James, r 8, 300 sugar trees, farmer 100. Whitehill Moses H , r 28, jobber in lumber, h and lot. Whitehill Newton, r 23, with his father, James, farmer 110. Whitehill William A., 800 sugar tree, farmer 200. WILSON ISAAC, r 7, 800 sugar trees, farmer 140. Worcester Fred, section hand M. & W. R. R. R.
WORMWOOD DANIEL, r 35 cor 34, 250 sugar trees, farmer 100. Wormwood Thomas, r 34, retired farmer. h and lot, aged 81. Worthington Martha J., widow of Rev. Watson A.
Wrinkle Betsey, widow of Rev. Thomas, h and lot.